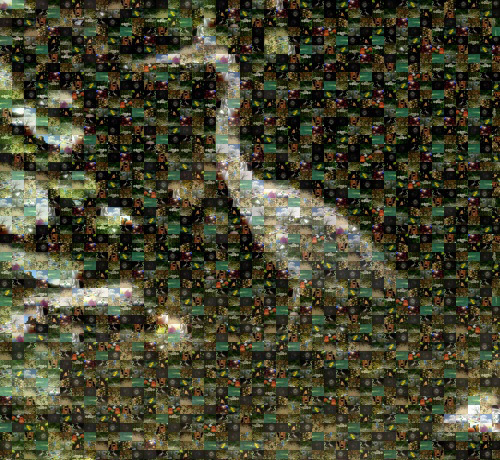 Andrea Mosaic is a really neat & easy to use program that I have used for years. If you are looking for a one-of-a-kind gift to surprise someone with this Christmas, you might want to check it out. I’m not sure if the website offers a newer version than the one I’ll show you, though mine is years old and operating on XP. 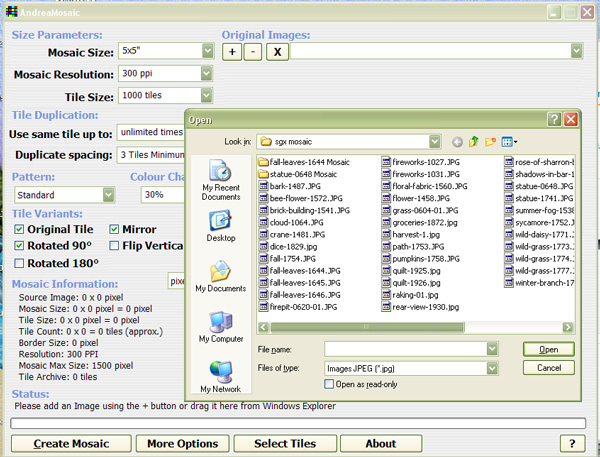 First, as shown above, open the program and select the plus sign near the top to insert the image you want all of your pictures to form. In my case, I selected the crane. Notice the setting on the left. If you hover your mouse over an area for a minute, a pop-up will appear explaining what each option does. For print, you want the ppi to be set high. Next, click the ‘select tiles’ button on the bottom. 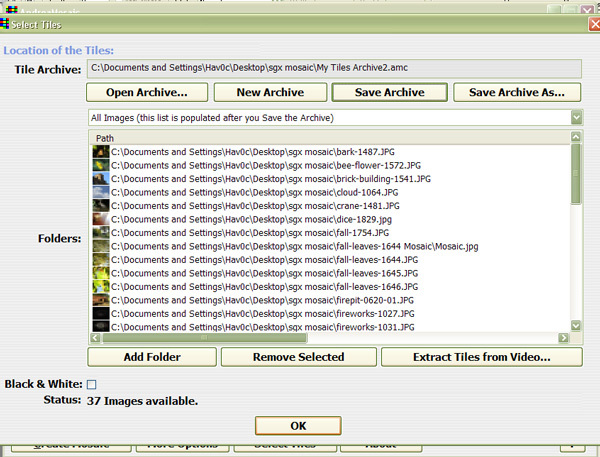 This will open a window for you to navigate to your folder with the images you wish to use to create the mosaic. 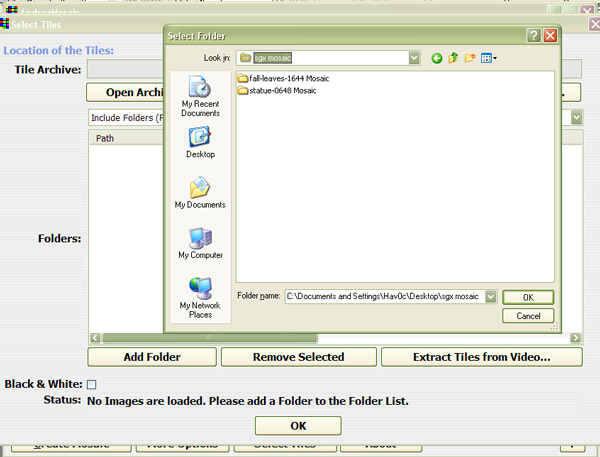 Note that it can also select any subfolders located in the selected folder. Click ‘OK’ to select the folder. 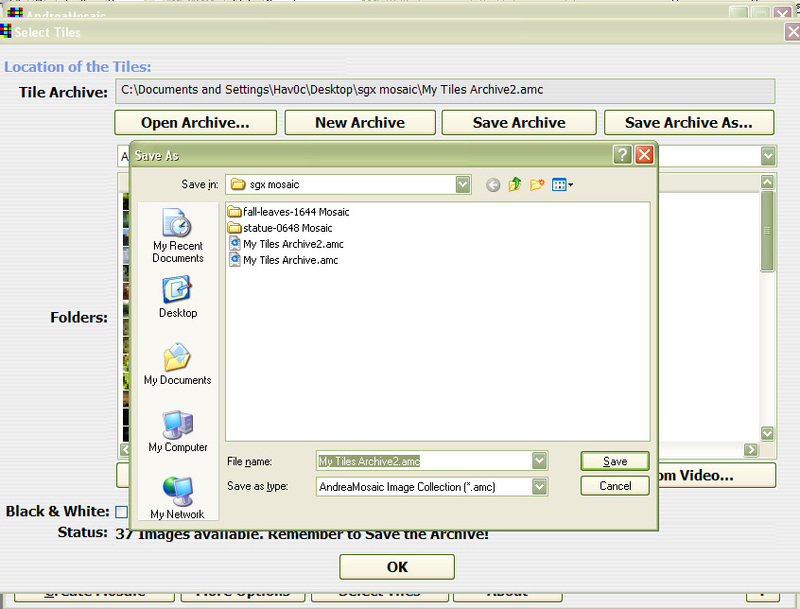 This shows the images added. Click ‘OK’ to continue. 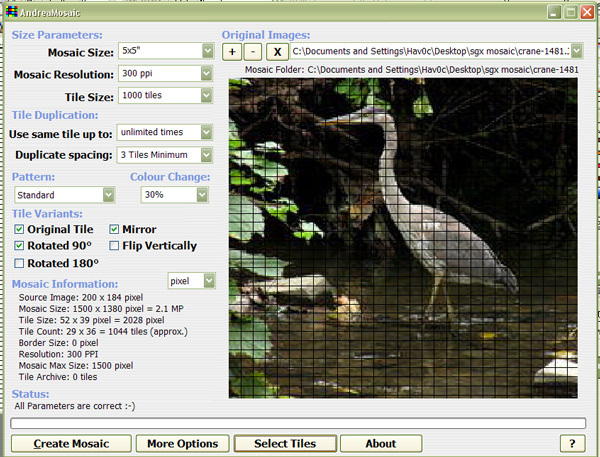 Click ‘Create Mosaic’. The statue bar at the bottom will show your progress. When it’s completed, it should give you the option to open the folder it was saved to so you can preview it. Before printing, make sure you zoom in at 100% and check for pixelization. Also, double check your measurements in inches. If you plan on having a print shop print it, run a test print to check for sharpness. Looks like it may have been a painting in another life, except for the window could use some straightening. On to mundane problems, I think my trusted 2001 Dell XP is finally on it’s way to dying on me, or maybe it could just use a reformatting, which I’m too lazy (or busy, take your pick) to do right now. I’ve got a lot of programs installed on the main drive and surely some files there too. So, I’m in the living room on the kids computer writing now and pondering what to do with my oldy-but-goody computer. Thankfully I remembered most of my passwords, even wordpress, and have been able to at least migrate some of the important things like email and my web host. Since I did remember my password to WordPress this morning, I logged in and noticed some other blogs that were following mine. First off, if you read this, thanks for following me. 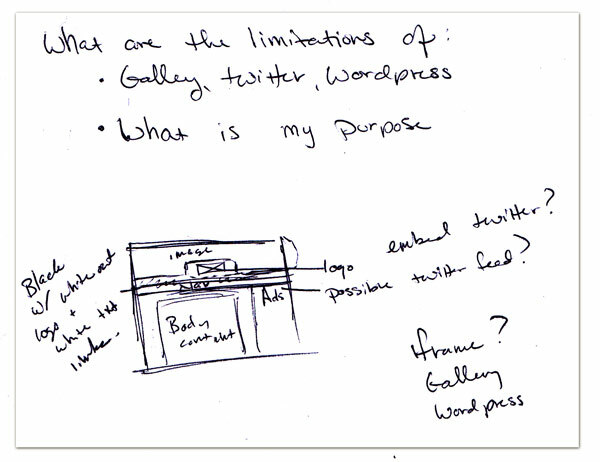 I still consider myself new to WordPress and honestly have not taken the time to look around the whole site to figure it out. I can post something and change my theme as well as find the ‘freshly pressed’ button. I can also click on names of people who are following this blog, which I did this morning, and found some really excellent writers! I spent about an hour reading between two other bloggers and instantly recognized that they have a natural talent for writing (something I lack, though always appreciated). I followed them back, because frankly, their writing style rocks and I look forward to reading more from them. Me… I’m not a natural writer. 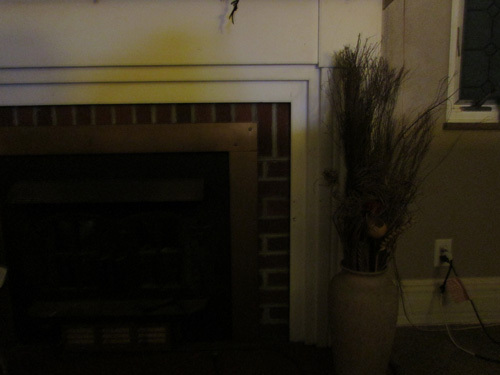 I had control over the shutter speed and turned it way down to let in as much light as I could because the room is poorly lit, while the shutter was open I jolted the camera at the object (in this case, a cheap Hawaiian lei from a party this summer). It produced an interesting effect.